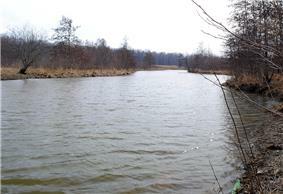 Woods Creek is the west boundary of Buckhorn Island State Park. Buckhorn Island State Park is an 895-acre (3.62 km2) New York state park located in Erie County, New York, in the Town of Grand Island. The park is on the northern end of the island of Grand Island. Buckhorn Island State Park is primarily an exhibit of Niagara River wetlands, and is managed as a preserve. As such, the park offers space for largely passive recreational uses, such as biking, cross-country skiing, fishing, hiking, and a nature trail. A portion of the park has been set aside as a bird conservation area in order to protect nesting habitat for several species listed as threatened in New York State, including the least bittern, northern harrier, common tern, and sedge wren. The protected habitat also serves as a feeding and breeding area for numerous other species of waterfowl. The park's wetlands serve as an overwintering location for 19 species of gulls, nearly half of the world's 45 species. ^ a b NYS Office of Parks, Recreation & Historic Preservation. "Buckhorn Island State Park". Nysparks.com. Retrieved June 1, 2015. ^ Carpenter, Gerald; Crawford, June Justice (2015). Grand Island: Images of America Series. Arcadia Publishing. p. 10. Retrieved June 1, 2015. ^ "State Park Annual Attendance Figures by Facility: Beginning 2003". Data.ny.gov. Retrieved June 1, 2015. ^ NYS Office of Parks, Recreation & Historic Preservation. "Buckhorn Island State Park Bird Conservation Areas". Nysparks.com. Retrieved June 1, 2015. ^ Freeman, Rich; Freeman, Sue (2001). Winter Trails: Cross-Country Ski and Snowshoe in Central and Western New York. Fishers, NY: Footprint Press. p. 49.